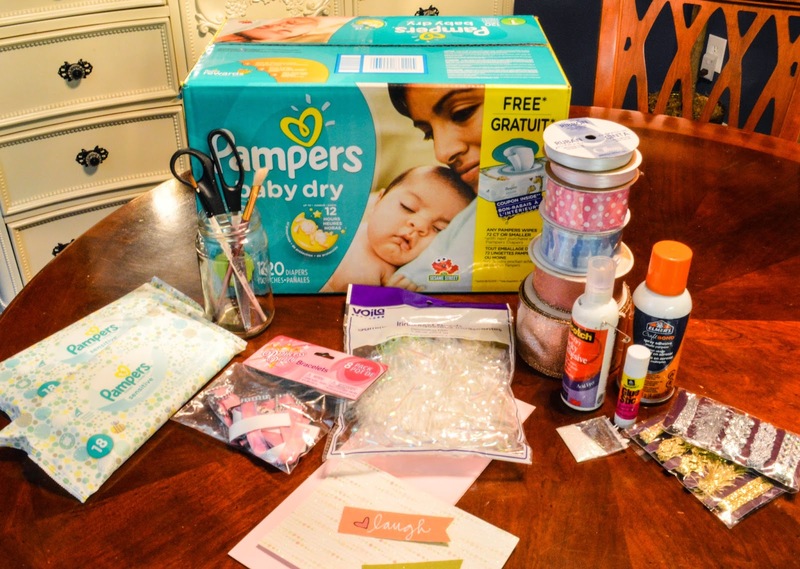 Entertaining Grace: Palais De Pampers: The girliest of diaper cakes for a beautiful baby shower! 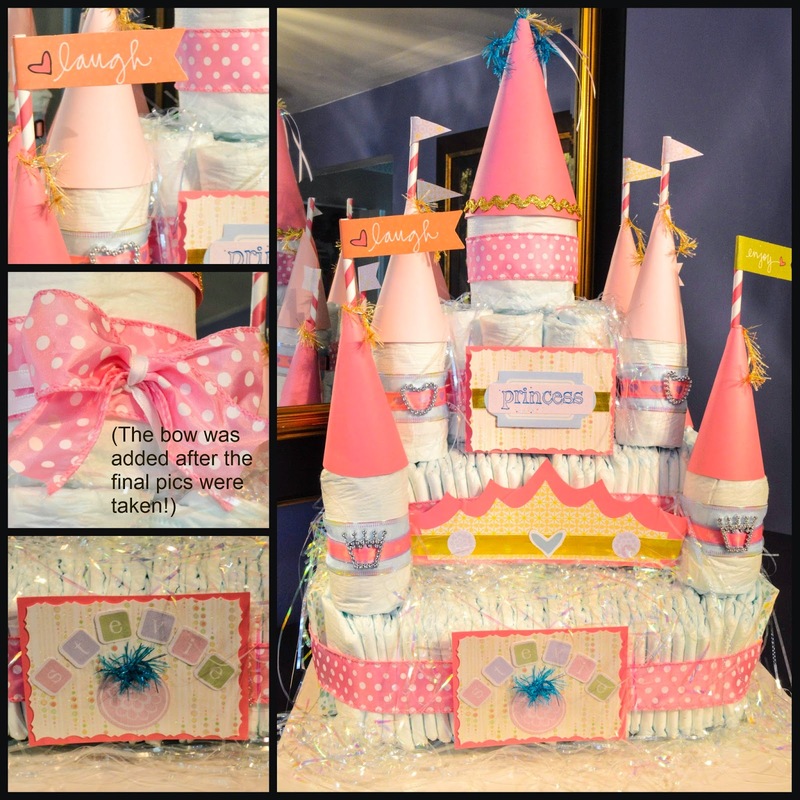 Palais De Pampers: The girliest of diaper cakes for a beautiful baby shower! One of my dearest friends (D) just had a gorgeous baby girl and tomorrow is the shower for her newly-hatched munchkin. Months ago D made an off hand comment about diapers being the best thing you could get a new mother as the need for them is quite high, so, when baby Stevie arrived, I figured I'd go with a gift that's high on practicality. Instead of just wrapping up a box of nappies and handing them over however, I wanted to create something a little special and a little silly. It's a celebration, after all! 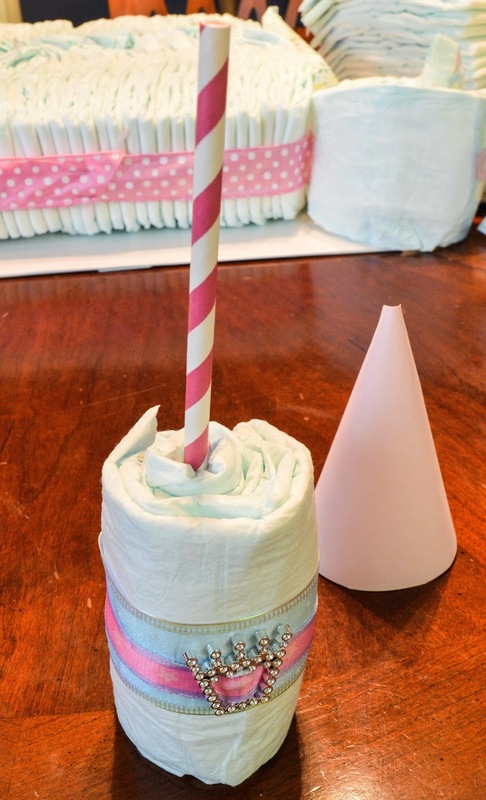 I've seen diaper cakes quite a bit, and though they're cute, I wanted something a little more creative. Diaper Tricycles are freaking adorable, but I thought I might save that diaper creation for a baby boy. 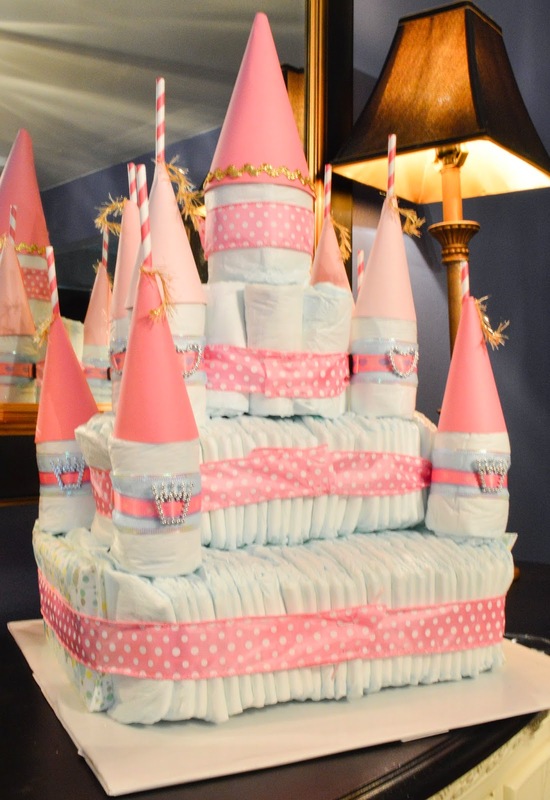 Instead, I settled on creating an over-the-top Diaper Castle. What little girl DOESN'T want a castle?! The final (ridiculous) result was worth it. A Pretty Palace of Pink and Purple Paper, Pennants and Pampers is standing ready for tomorrow's party (Alliteration is my jam). Below is the whole Peppy Process (What? P's are fun!). 1. 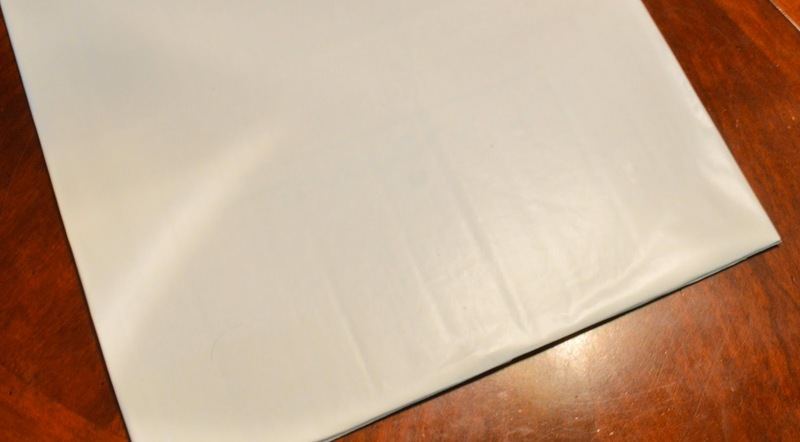 Cover your cardboard with wrapping paper and secure with tape or spray adhesive. will be your base). They WILL want to fall down. You can use rubber bands to hold them in place, but I didn't care for the dent they made in the "walls". Instead, I used a bit of tape on each corner to hold in place while I tied a ribbon around. 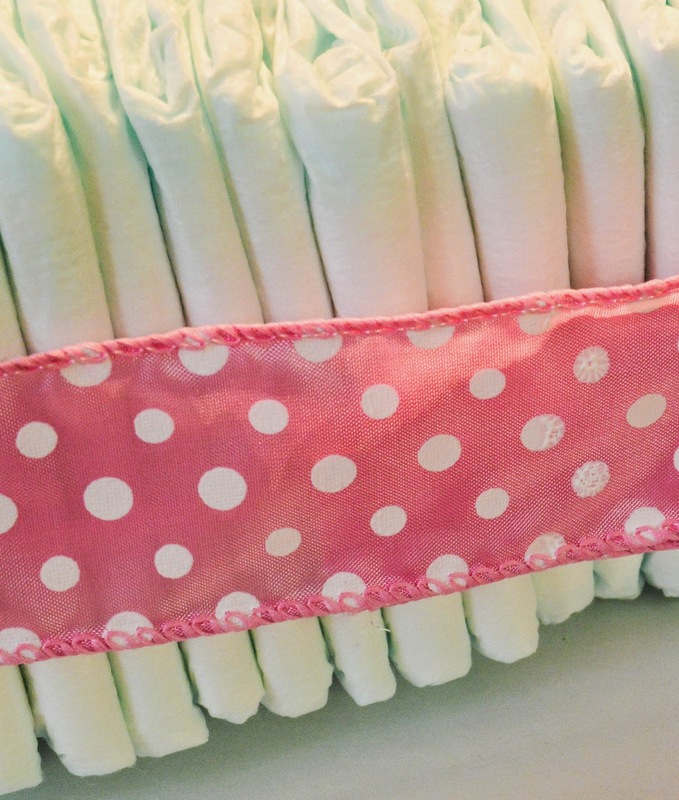 Insert a package of wipes under the ribbon on either side of the bottom layer. 3. 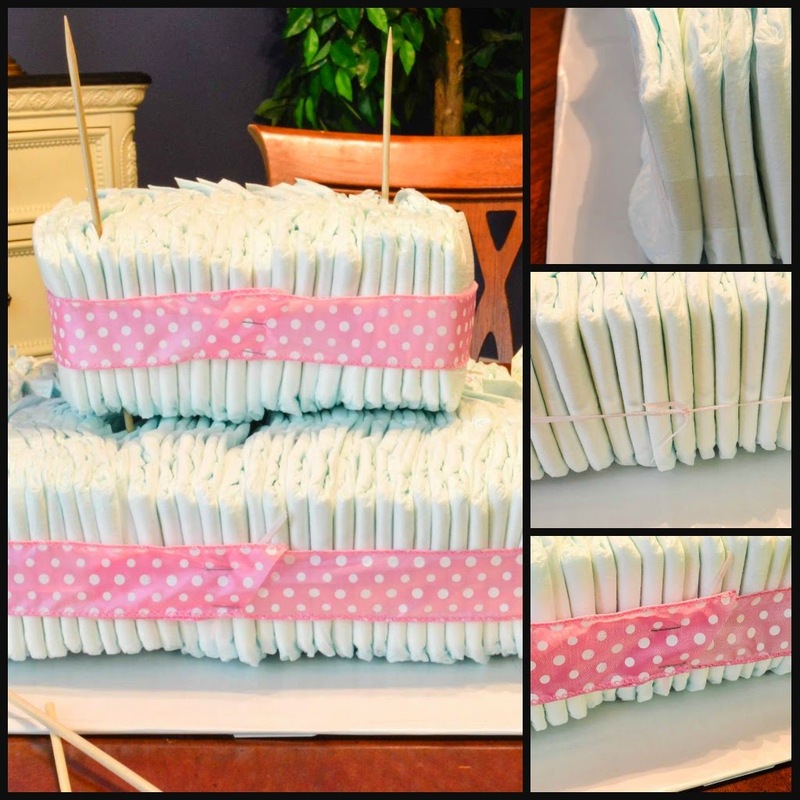 Create a second layer of 30 diapers. 4. 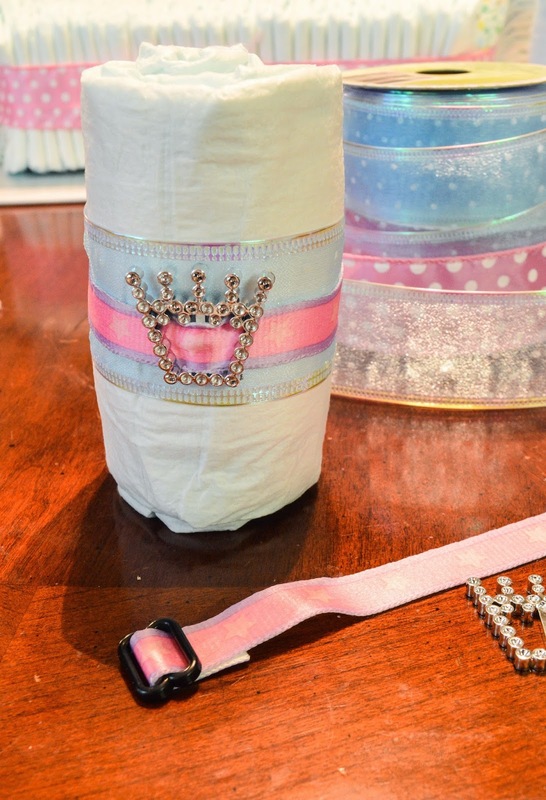 Starting with a folded diaper, roll into a tube shape, and secure with a piece of tape. Repeat with the next 8 (9 total). Gather them in a round and tie. 5. 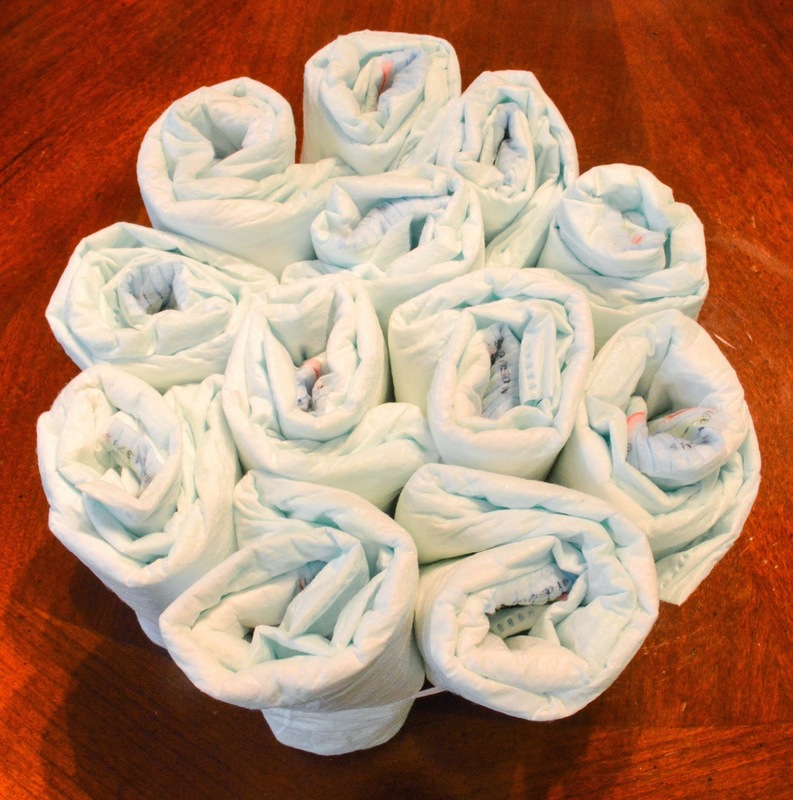 For the top layer, create one large round by rolling 5 diapers together. Fasten with a ribbon. 6. Working carefully, insert skewers between each layer to anchor. 1. 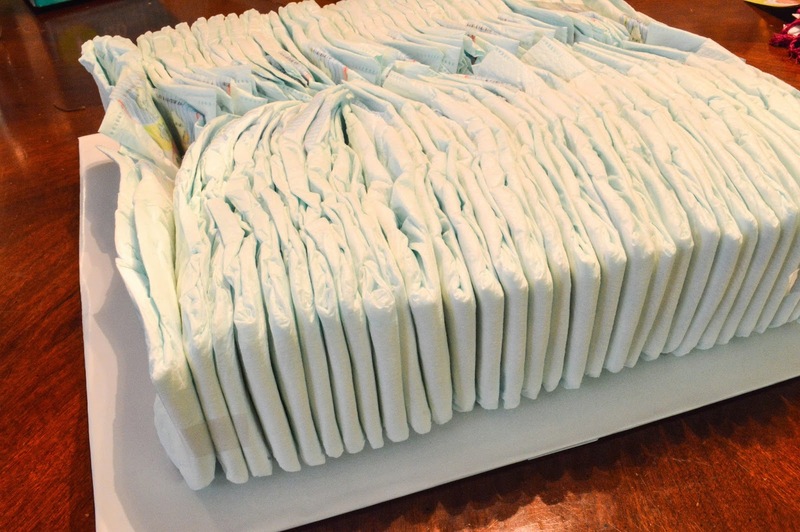 There should be sixteen diapers left to work with. Working with two, tightly roll and secure with tape. 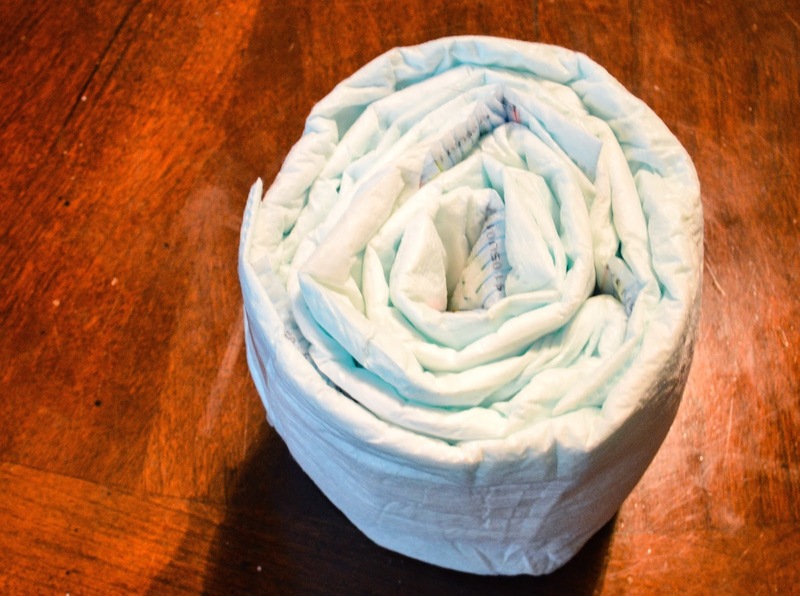 Repeat with remaining diapers to create 8 total cylinders. Wrap with ribbon(s). 2. 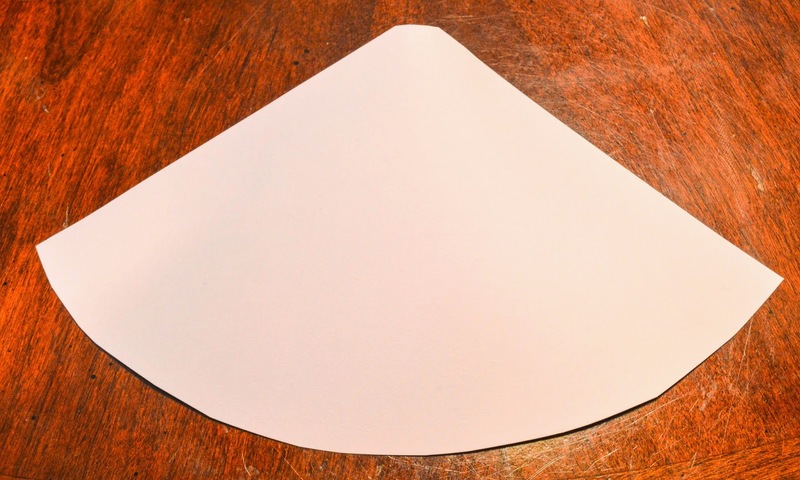 Working with your scrapbook paper or cardstock, create 8 cones wide enough to fit snugly over the top of each cylinder. 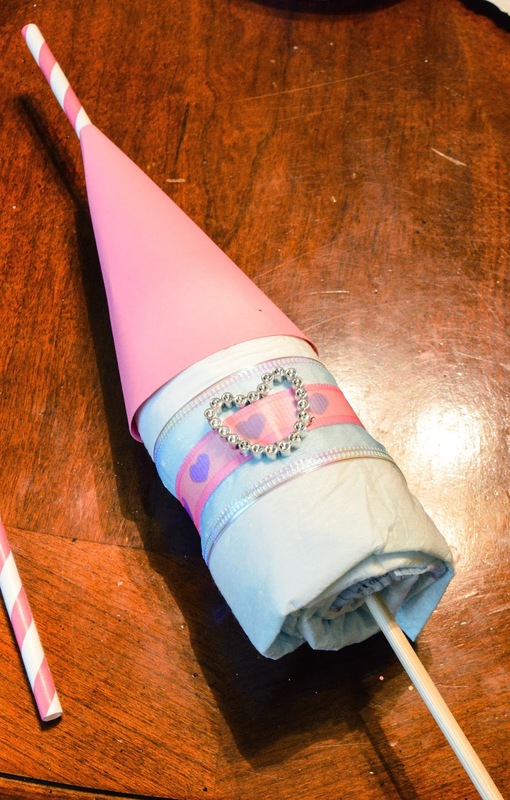 Leave a small hole in the top of each cone, for a straw to slip into. 3. 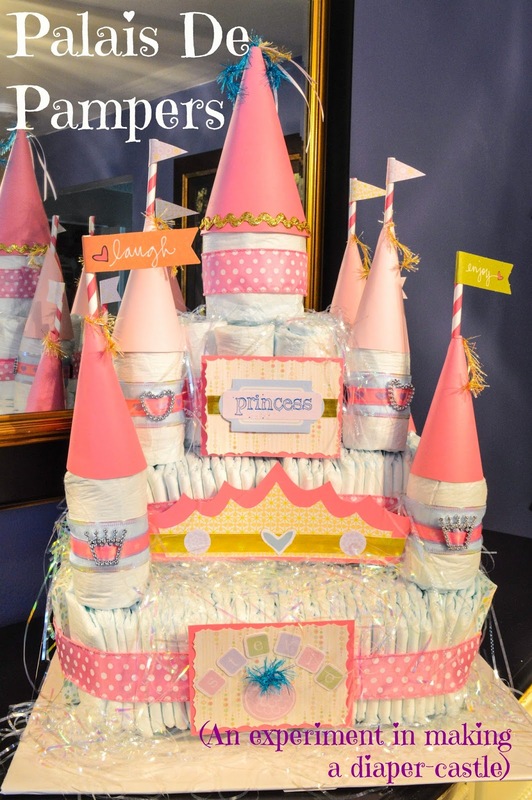 Create one large cylinder to attach to the top tower of the castle (the roll of 5 diapers). 4. In the center of the bottom of your turret, insert half of a skewer partway. Use the remaining part to secure to the top of your first layer. 5. Loop string through the ribbon on your turret and the ribbon on your second story structure, pull tight, and tie. This should affix one to the other and give you a more stable construction for transport. Repeat with all corners of the second and third story. Structure Complete! Now on to the fun stuff! This is the fun part. Using scraps of colorful paper, stickers, stamps, or glitter, create flags for your straw flag poles, doors and windows, tags, crowns... whatever!! The final step was to add the gifting shreds to the bottom of each layer. The iridescence is so fun and pretty! I'm hoping that my friend will get a kick out of the silly structure. My next project is to create a Big-Sister's Gift for her older daughter. I'll share some pics if I manage to get it done in time! !